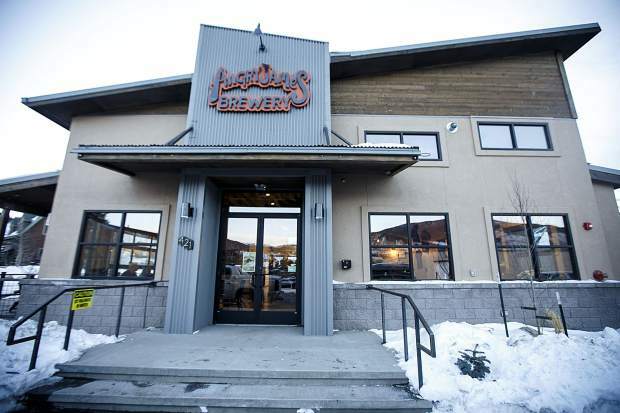 At the foothills of Silverthorne inside a reasonably large freestanding building a mere three miles west of Bakers Brewery, highly respected ANGRY JAMES BREWERY opened for biz January 26, 2018. Residing in the nondescript semi-industrial area just off Route 70, this glorified cafe features modern wood-designed furnishings, a 12-seat concrete-lacquered bar and enclosed side deck with gas fire pit. 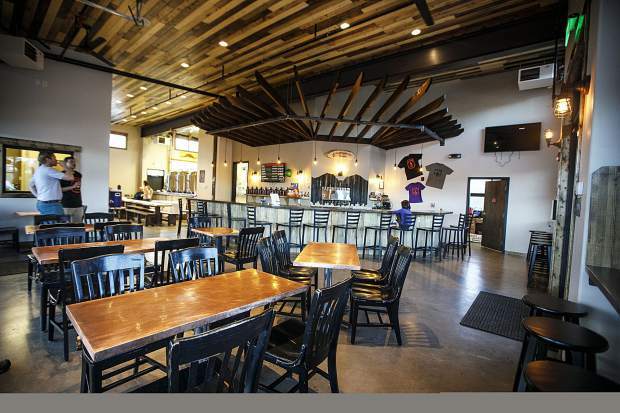 The partnered Cultivate Kitchen serves a limited smattering of ‘off beet local eats’ from veggie lovers plates to bison chili dogs to complement the delightful homemade suds crafted by entrepreneurial couple AJ and Darcy Brinckerhoff. Two electronic blackboards list the beers currently on hand and two TV’s keep sports fans at bay. My wife and I plus long-time friend Dennis take seats at one of the community tables near the side-decked overhead door to consume all ten brews on hand this sunny March ’19 afternoon. Easygoing sugary pale-malted opener, Jake’s Pils, gained a musky wet-grained herbal hop pungency to contrast its caramelized lager yeast setting. Just a tad beyond typical German pale ale styling, efficiently light-bodied Bavarian Blonde utilized gooseberry-soured, tangerine-sweetened Mandarina hops to engage its dry cereal-grained bottom. Candi-sugared Belgian blonde, Pali Wog Pale Ale, stayed dryer than stylistically expected as herbaceous white-peppered spicing saddled lemon meringue tartness, lemon rind bittering and lemon-candied sugaring, gaining tertiary banana, peach and green apple illusions as well as possible sage-thyme passages. Sour lemon-drop candy draped phenol banana-clove soaping above creamed wheat flouring of moderate Alpen Weisse, a dryer stylistic take on a German-styled hefeweizen. Dry Imperial Red Ale, The Emperor’s Red Robe, sufficed with its dewy moss sweetness contrasting resinous pine tones alongside sweet orange-spiced grape juicing before mild sarsaparilla bark adds tea-like residue. Straight-ahead Terrifica Double IPA brought tangy citrus spicing to mild piney juniper bittering and sticky pine resin. Briskly vibrant grapefruit-peeled orange juicing enlivened Tricentric IPA, bringing light caramel spicing to the fore as spritzy lemon, tangerine and tangelo undertones flutter. Sinewy honeyed Scotch malts and dewy rye breading inundated Norwegian Farmhouse, an offbeat saison with mild green grape esters and orange-lemon liqueur enticement gaining a briny vodka snip. Creamily soft-toned Two Tone Footer Stout – Nitro let cinnamon-toasted coconut sweetness and dark chocolate malting rub up against Graham Cracker-like wheat sugaring, changing the complexion of the richer, carbonated, coffee beaned Two Tone Footer. At nearby competitor Bakers Brewery, sipped serene wheat wine, Gin-U-Wine, a unique ginger-spiced hybrid with mild juniper berry bittering skewing its lemon-peeled grains of paradise tartness and pine-needled lavender and rosehips illusions.